It’s Crowded! It’s Mobbed! So Many People Speaking others Languages! It’s…Old Faithful! One of our first stops in Yellowstone Park was the infamous Upper Geyser Basin – the fascinating, much-loved, crowded, trampled Basin. The most famous spot in the park – visited by most who come to the area. Crowded and occasionally frustrating, once you venture away from Old Faithful itself you can explore the rest of the Upper Geyser Basin quietly. We attended a Ranger-led tour – a common theme for this trip to Ystone . We now attend park Ranger programs ever since we started to do Interpretation in other Parks. Or maybe we are just getting lazy. Hmm. Ranger Jim explained much of the history of the area, early Non-Native American visitors and the Washburn Expedition. Nathaniel Langford, a member of the group, had personal connections with Jay Cooke of the Northern Pacific Railroad well before their expedition. Cooke was interested in development of Yellowstone to serve as a railroad destination. Yellowstone sits atop an active volcano – the Yellowstone caldera – which will see another eruption sometime in the future. 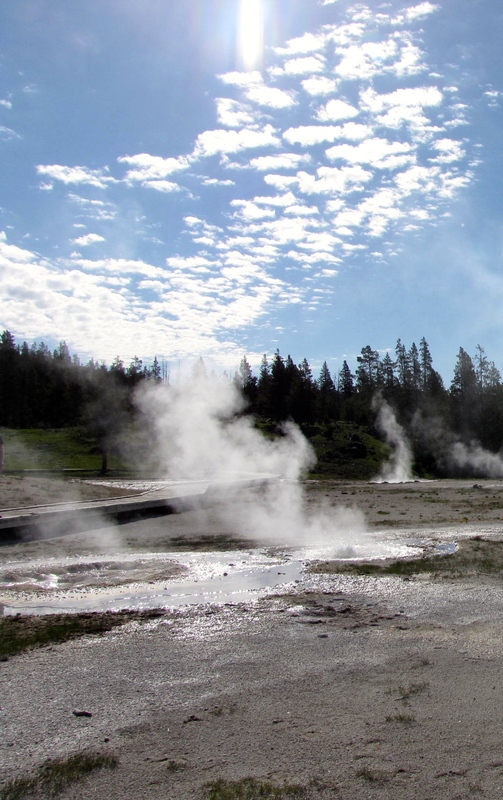 Signs of the active volcano surround you as you travel through the geyser basin. 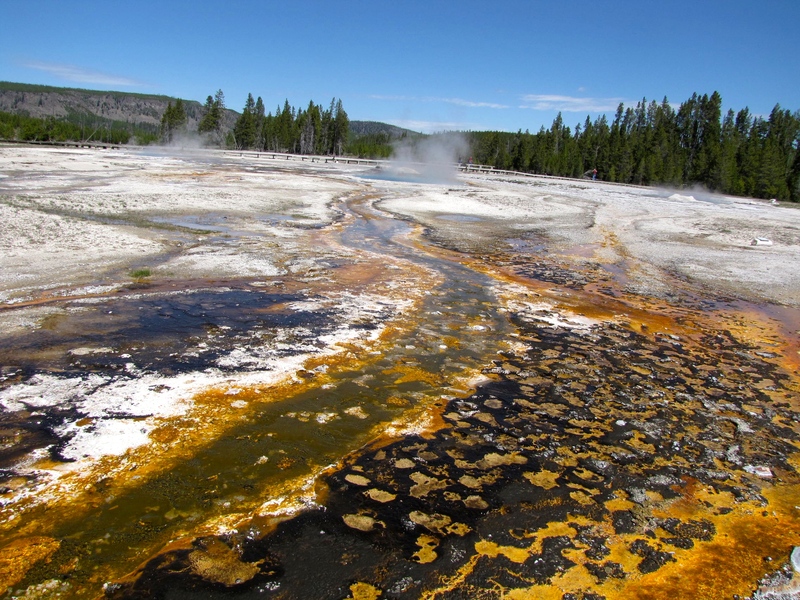 While Old Faithful is the most consistently visible sign of this activity, it is also apparent in the many, many thermal features in the basin. 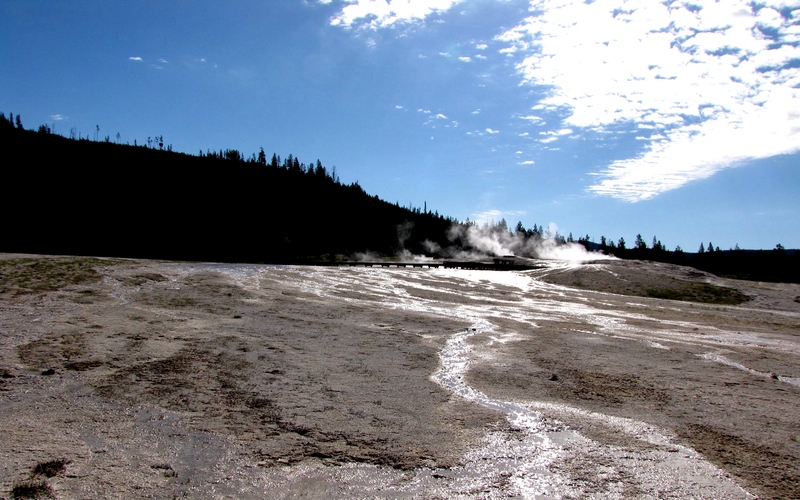 The Park Service makes the area very accessible with boardwalks throughout the basin leading you past the numerous geysers, hot springs and sulfur run-off. One year, we saw Old Faithful, Beehive and Castle geyser go off at once. A very enthusiastic Ranger ran around and made sure every one knew about the special event! Yellowstone possesses close to 60 percent of the world’s geysers. The Upper Geyser Basin is home to the largest numbers of this fragile feature found in the park. Within one square mile there are at least 150 of these hydrothermal wonders. Of this remarkable number, only five major geysers are predicted regularly by the naturalist staff. They are Castle, Grand, Daisy, Riverside, and Old Faithful. 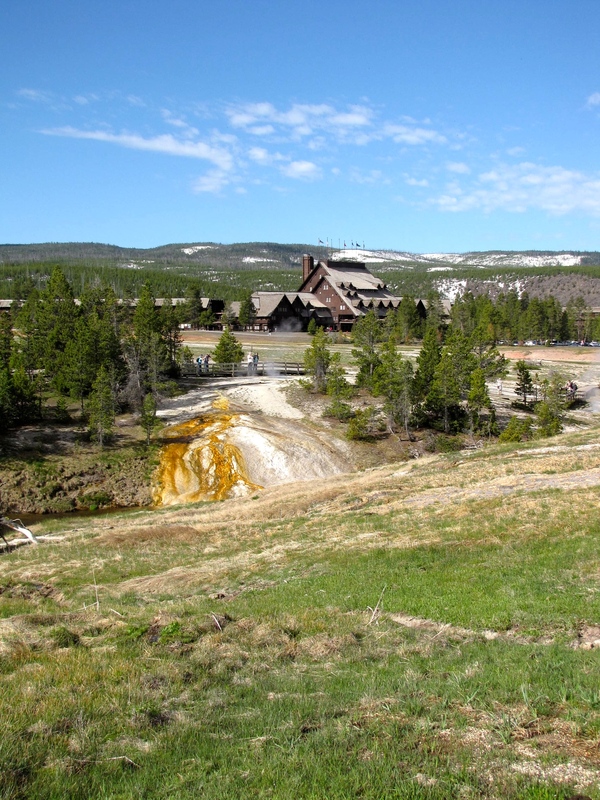 There are many frequent, smaller geysers to be seen and marveled at in this basin as well as numerous hot springs. Many thermal feature names were given Nathaniel P. Langford, a member of the 1870 Washburn Expedition – who named many of the thermal features of said “We gave such names to those of the geysers which we saw in action as we think will best illustrate their peculiarities.” Those names include Old Faithful-named for its regular eruptions; Beehive Geyser-with its bee-hive shaped cone; and Riverside Geyser-named for its location on the Firehole River. Named Old Faithful for its nearly regular schedule of eruptions – It is the grand old geyser of Yellowstone because of its frequent and predictable eruptions. The intervals between eruptions average between 45-90 minutes and the average duration is about four minutes. To predict the next eruption, its first continuous surge is timed until the final splash. If the total eruption is less than four minutes, the next eruption will occur in approximately 40-60 minutes. If the eruption is four minutes or longer, the next interval will be 75-100 minutes. Old Faithful does erupt approximately every 2 hours and is predicted by the Rangers based on the duration of the preceding eruption – the longer the eruption, the longer the time before the next event. The Old Faithful Inn is positioned to take advantage of the views of the geyser from the numerous porches on the front of the building. 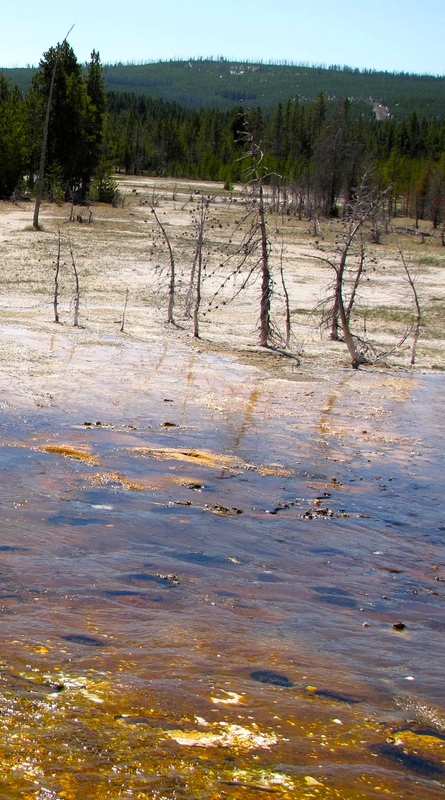 Many visitors to the area only see Old Faithful without venturing any further – unfortunate! Numerous geysers are in the area and many erupt with great frequency. The 1870 Washburn Expedition camped near Old Faithful and discovered the geyser had frequent and regular eruptions over 100 feet. They dubbed the geyser Old Faithful. Another great spring is Punch Bowl —the name, descriptive of its punch bowl shape, was given by members of the 1871 Hayden survey. The crater is a raised rim about 30 inches high. Water constantly boils and bubbles around the edge resembling a large, bubbling cauldron. During the turn of the century, hot water was piped from Punch Bowl to a tent camp a quarter of a mile to the north. It is one of the few thermal features on which human tampering has had no disastrous effect. Ribbons of bright green and orange cyanobacteria line the run-off channels. CASTLE GEYSER is one of the larger geysers in the area. Members of the 1870 expedition named this feature for the “resemblance to the ruins of an old castle.” The large cone is nearly 12 feet high with a diameter of 20 feet at the top. Castle was an irregular geyser, with periods of dormancy, before the 1959 earthquake. Since the earthquake, it has been a regular, easily predictable geyser. The water phase of an eruption lasts about 15 minutes and a steam phase, similar to a steam locomotive( in both appearance and sound), lasting an additional 45 minutes. 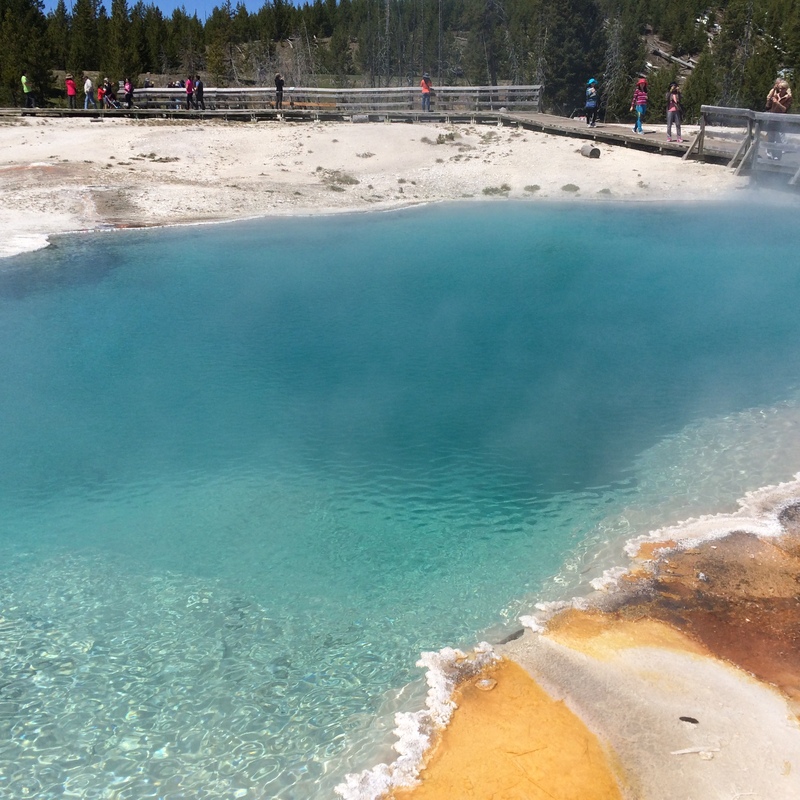 Personally, the most beautiful thermal feature is the Morning Glory Pool – Not a Rock Star like Old Faithful but Better! Prettier! less faithful! A deep, funnel-shaped pool with a dark blue center, resembling shape and color of a morning glory is responsible for its name in the early 1880s. It has been a popular thermal feature and a symbol of Yellowstone. The early stagecoach and automobile road came within a few feet of this pool until 1971 when the road was rerouted. Early visitors carelessly removed the delicate scalloped border and dumped debris into the pool. In 1950 the water level was lowered by siphoning which induced the pool to erupt. Socks, bath towels, 76 handkerchiefs, $86.27 in pennies, $8.10 in other coins came up; in all, 112 different objects were removed from Morning Glory. The debris had reduced the flow of water and contributed to the temperature drop in causing bacteria to grow in the cooler yellow and orange edges of the pool. However, my new favorite thermal feature is Black Pool! Named after many hangovers experienced by the Stenger member of the Winecoasters Expedition. Not really. Ranger Jim pointed out a thermal feature (in another part of the Basin) that made noise and shook the ground before it displayed any activity. Jim stated other thermal features in the Basin exhibited similar characteristics – we just had to find them! Well, when we discovered what the Black Pool had to offer at the back edge of the UGB we thought we were part of our own Expedition. We had the spot to ourselves and while we were overlooking the bright blue water, Donald & I heard a thumping noise and felt vibrations in the ground – and then bubbles from the pool. No dramatic geyser exploding into the air but the pre-show was incredible! The warm up (thumps, vibrations) was much better than the actual activity in the pool – and it was great!! Hope if you have visited Yellowstone hope you enjoyed it as much as we did. If you have not visited the park, hope you get there someday. It is filled with never-ending wonders. Wonderland! Miscellaneous pictures from the basin…..